Last summer we took an impromptu trip with some friends to Muuido, an island on the west coast of Korea just a fifteen minute bus ride and a five-minute ferry from Incheon airport. Now that we live so close to the airport, we’ve been meaning to go back but still haven’t gone. This was the first time we saw Koreans really camping – like, putting up a tent and staying overnight, not packing it up in the evening once they’re done picnicking. Still, it’s not rural camping – there were restaurants on the island that deliver meat and a hot grill for you to bbq at your own tent – but there are a few beautiful walks and hikes and I loved waking up to the ocean right outside of our tent. Yes, I want to go to Seoraksan again. I’ve been three times in the two years I’ve been in Korea, but all were in autumn or winter. I’d love to see Seoraksan when everything is green. The hiking is beautiful and near some gorgeous beaches on the east coast. This is one we haven’t seen at all. I really want to head south to wander through the tea fields. We missed a trip over a long weekend last spring, but friends said it was beautiful. Looking at this list, our weekends are almost all filled up already. Maybe we’ll swing by the tea fields on a drive down south? I have been inhaling street food when we see it because I’m just not sure when the last time will be. In the winter there’s hotteok, a deep-fried pancake with brown sugar and nuts in the center. It appears to be a cold-weather food; the hotteok stands shut down in the spring and summer. So every time we’ve passed a hotteok stand, I’ve insisted on picking one up. Now that our time here is coming to a close, I’ll have to do the same with all the rest of our favorites. The only time we have spent in Busan was in the first three weeks of arriving to Korea. 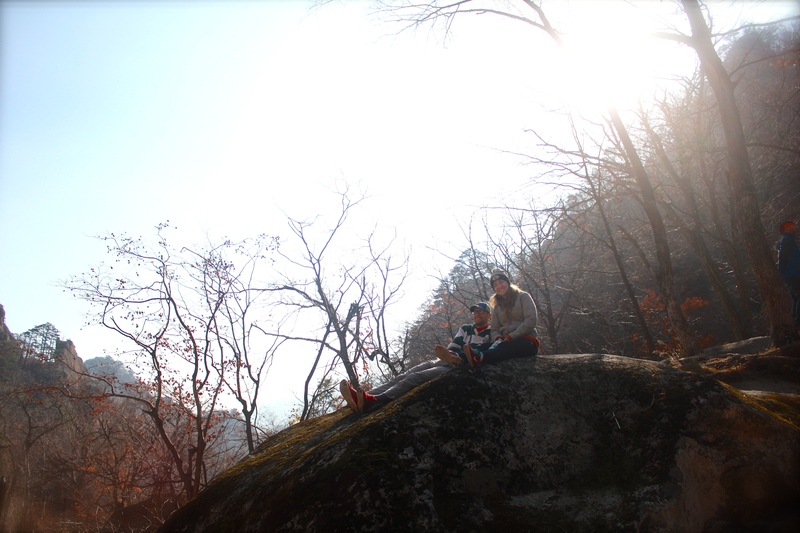 We loved the hikes around the city and the different feel from Seoul, but haven’t managed to make it back since. I’m hoping to wander the cliffs and visit a few of the seaside temples. 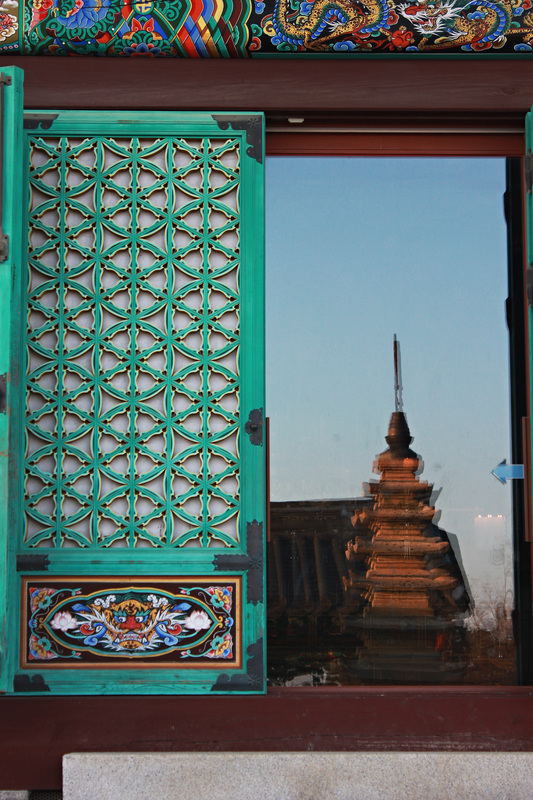 Yeah, we’ve been to Gyeongbokgung Palace a few times, at pretty much every time of the year. But it’s so beautiful and full of great photo ops, and is simply a nice walk. I would like one more stroll through the palace. We’ve only made it to one Korean baseball game since moving here, but it was so much fun. Chants and songs and lots of yelling made this such different experience from American baseball. Our closest team (the Heroes) has a game next weekend so we’re off to politely ask one of our Korean friends to help book us tickets. It still boggles my mind that there’s this much nature in Seoul. 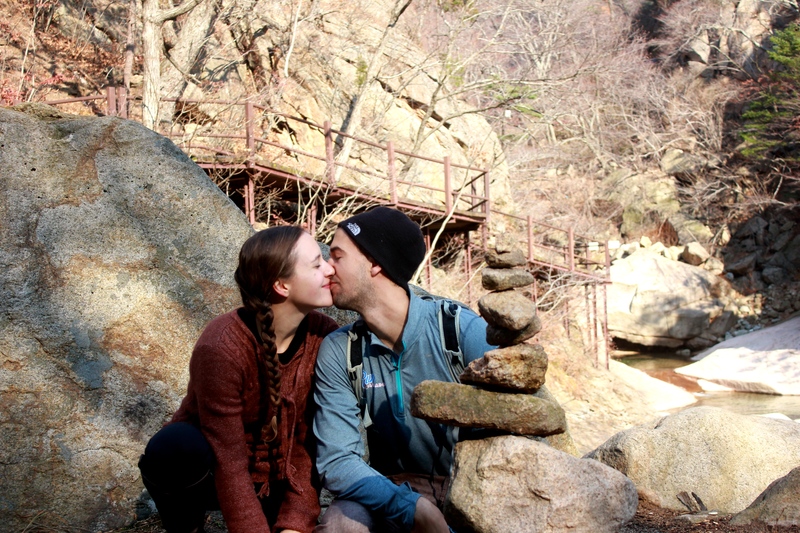 The mountains in Bukhansan National Park are gorgeous, and Ryan has been spending his weekends exploring and running the trails more and more frequently. I might die if I were to run with him (20+ miles. AHH) but I would love to go take a few more hikes and gaze down at the city. This is one I’m really torn on. We’ve gone this long without going, and it seems a strange sort of voyeuristic trip to stare over at the space between us and horrific human rights violations. At the same time, so many people who have gone (including our family) found it to be interesting, educational, and oddly beautiful. It’s certainly a one-of-a-kind experience. We should probably go. We’ve tried to make it to the War Memorial of Korea (which is also a museum), but they’re closed on Mondays which was oddly always the time we attempted to go. I love meandering museums and wish I had made it to more while in Korea, but this is at the top of my list. 2014 led to a pretty strong standstill for the blog, but with a plethora of photos and nowhere to put them, a 2014 recap is in order. 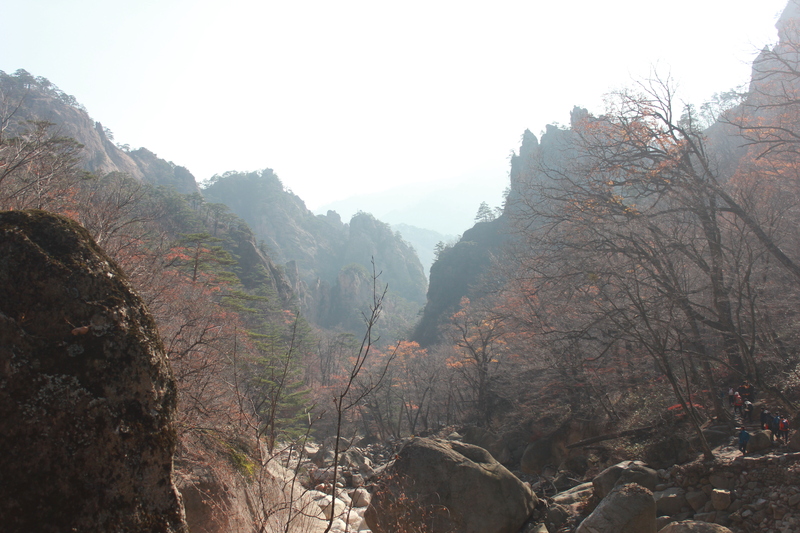 In the fall I took two trips to Seoraksan, once with Ryan and friends, and once as a school trip. The first time we still caught the fall colors, although we were weeks past the rush on the designated “peak foliage” dates 🙂 Unfortunately, there was an intense fog. This hike was the same one we did last year (Ulsanbawi) with sweeping views over the sea and surrounding mountains, but this time we could hardly see past our hands. The next day of our trip was nice and sunny, perfect for our walk through Heulimgol Valley. For the trip with my school, we started out in Sokcho and went to visit Naksansa Temple. The next day we went to Seoraksan. All of the trails were closed so I was convinced to take a cable car to the top of the mountain. We even got to hike a little at the top of the cable car, scrambling up a pile of rocks to peek over the edge of the other side. I didn’t think anyone else wanted to go so I crawled up by myself and then ran into a line of fellow teachers heading up on my way down. It was steeper than I thought – my hands were sweating and I got pretty nervous swinging from ropes anchored to the rocks, but it was quiet and beautiful at the top. I also got ample evidence that selfie sticks are out of control here in Korea. In November, we again went to the Seoul Lantern Festival, (directions here) braving the crowds along the Cheonggyecheon stream to view the lanterns set up above the water. 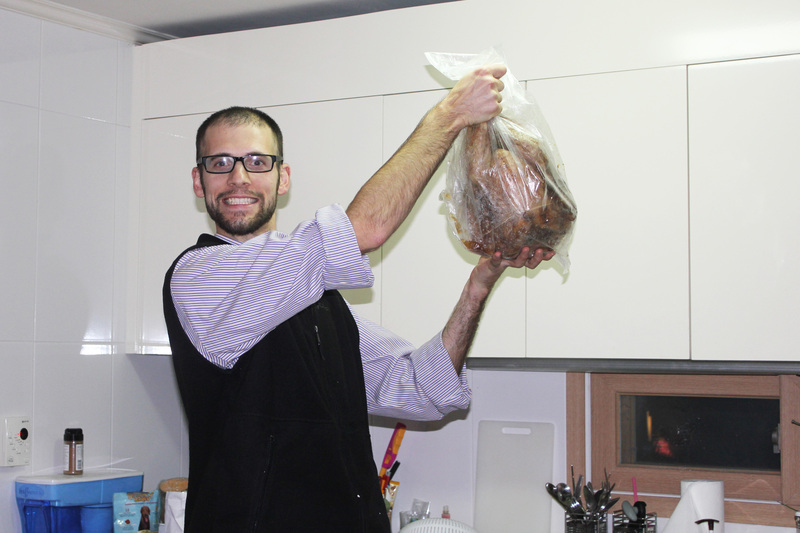 Also in November we coordinated a real Thanksgiving, including turkey. For a really severe lack of planning (minus ordering the turkey), we managed to pull together a full Thanksgiving feast. Someone found frozen cranberries in her freezer, someone else had butter to mash in the potatoes (I forgot the butter…), and when the turkey didn’t come pre-carved (as ordered), we got right down to carving it (with hands). It was very authentic, considering the turkey was supposed to be delivered at 6 PM but wasn’t delivered until 8 – very similar to the way the sides are usually finished being prepared far before the turkey is actually fully cooked. It was good we weren’t really cooking the turkey. Very thankful for good food and good people through all of 2014.